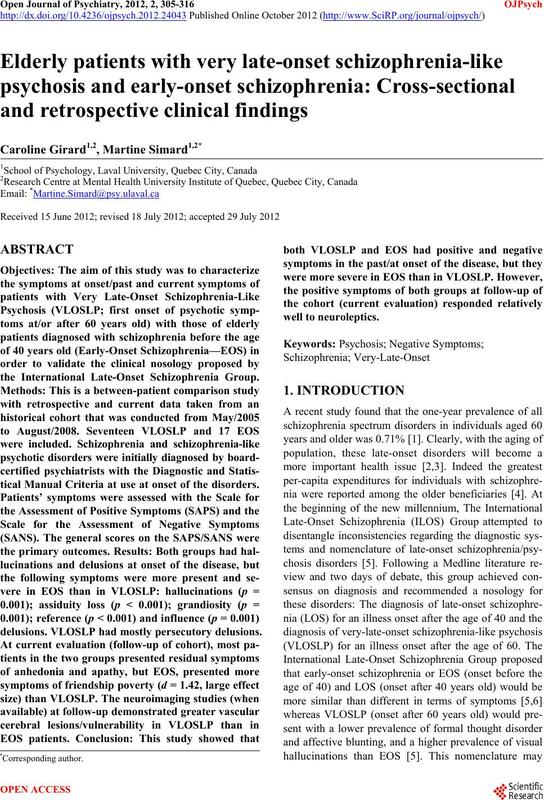 the International Late-Onset Schizophrenia Group. tical Manual Criteria at use at onset of the disorders. delusions. VLOSLP had mostly persecutory delusions. 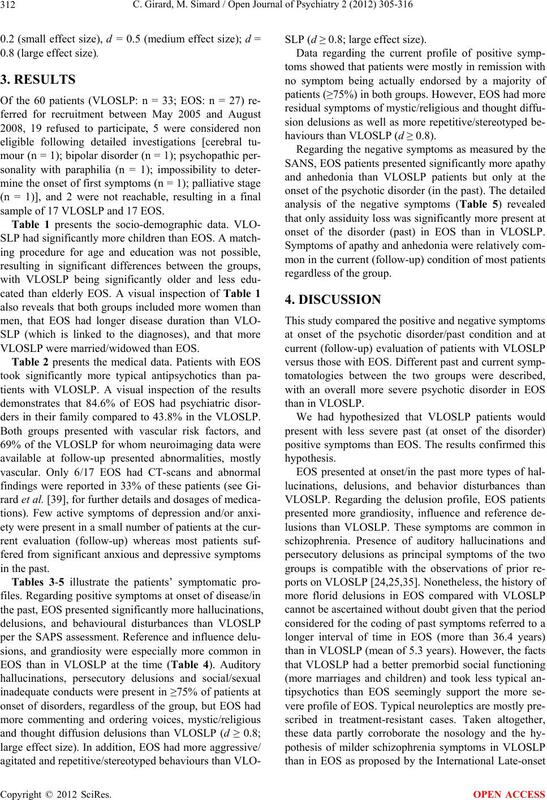 disorders in VLOSLP generated contradictory results. were present in EOS and to a lesser extent in LOS . 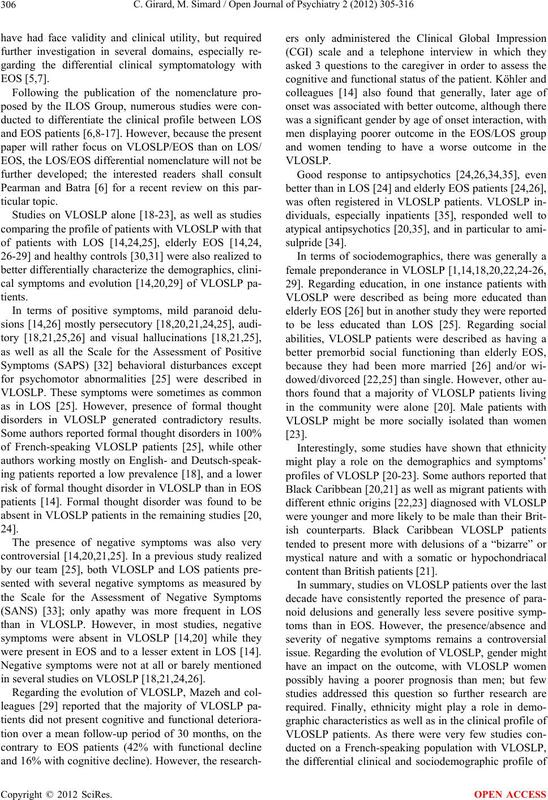 in several studies on VLOSLP [18,21,24,26]. content than British patients . cognitive results were presented in a previous report . hospitals in the province of Quebec, Canada. registered anonymously in the database. ses were performed using SPSS for Windows version 17.
were further analysed to specify the symptoms’ typology. Schizophrenia; Szophreniform dis. : Schizophreniform disorder; Delusional dis. : Delusional disorder; NS psychotic dis. : Non-specific psychotic disorder. *p < 0.05. Table 2. Medical data from medical records. 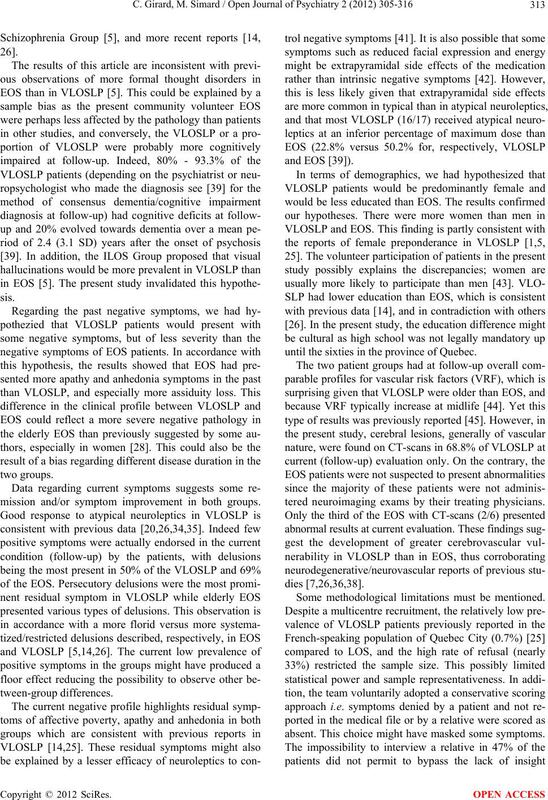 Legend: VLOSLP: Very Late-Onset Schizophrenia-Like Psychosis; EOS: Early-Onset Schizophrenia; Note: Access to medical files for 17 VLOSLP and 16 EOS. *p < 0.05. Table 3. General psychiatric profile. phrenia-Like Psychosis; EOS: Early-Onset Schizophrenia. *p < 0.05.
zophrenia; ES = Effect Size; SD = Standard Deviation. *p < 0.001.
sample of 17 VLOSLP and 17 EOS. VLOSLP were married/widowed than EOS. ders in their family compared to 43.8% in the VLOSLP. 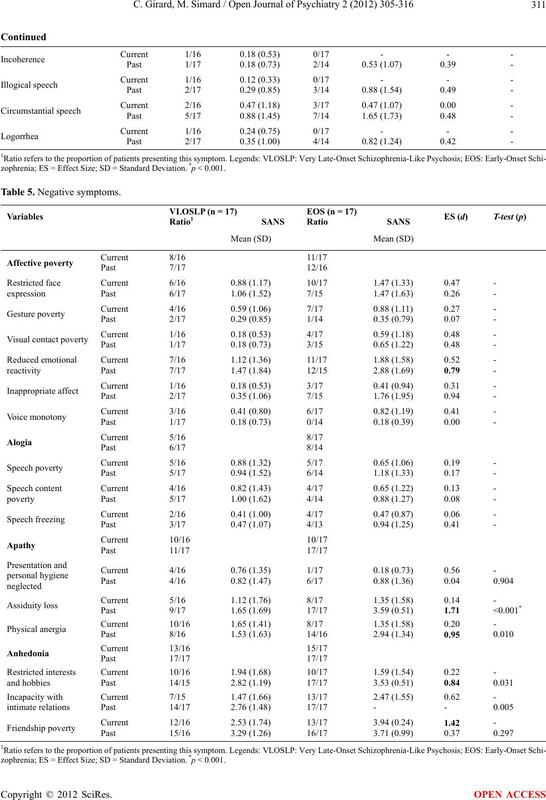 SLP (d ≥ 0.8; large effect size). haviours than VLOSLP (d ≥ 0.8). 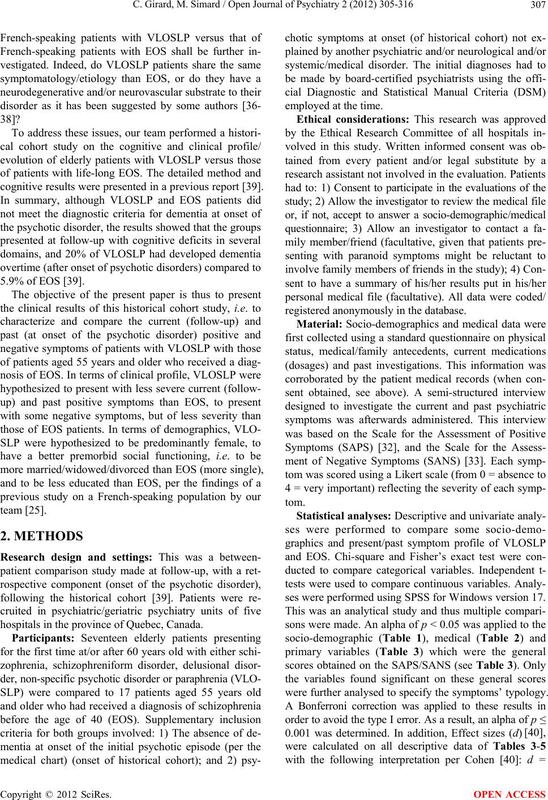 onset of the disorder (past) in EOS than in VLOSLP. mission and/or symptom improvement in both groups. until the sixties in the province of Quebec. tered neuroimaging exams by their treating physicians. Some methodological limitations must be mentioned. absent. This choice might have masked some symptoms. medications, institutionalization, poverty, etc. .
the presence of psychotic symptoms. Québec), and by a 2005 NARSAD Young Investigator Award (M.S). tional Research Society Conference, Firenze, Italy, April 10-14th, 2010. 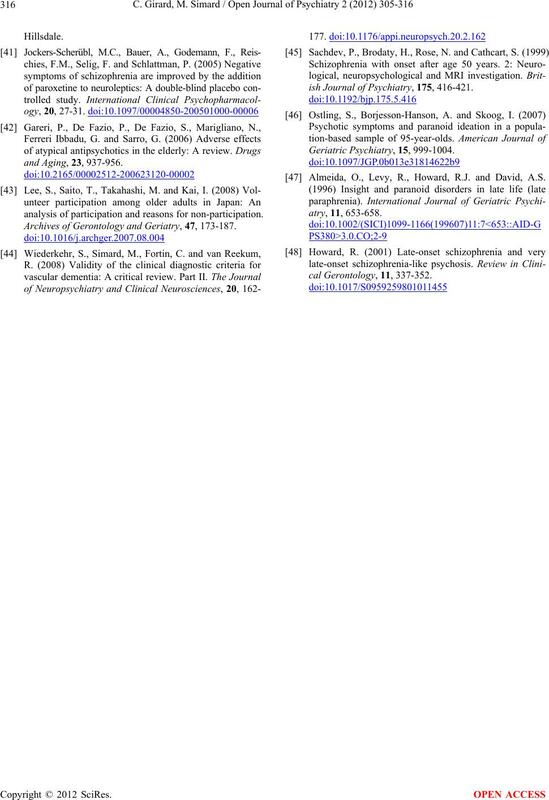 Journal of Geriatric Psychiatry, 20, 18-28.
can Journal of Geriatric Psychiatry, 11, 648-657. 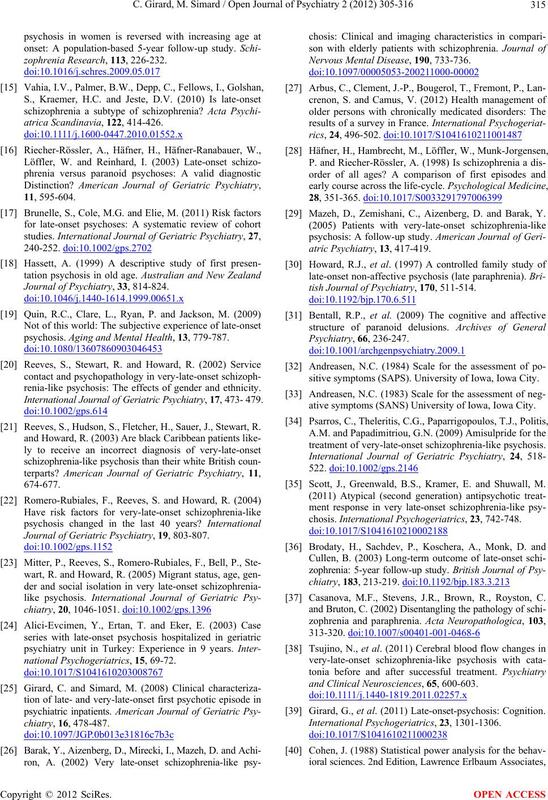 Journal of Psychiatry, 157, 172-178.
the literature. L’Encéphale, 35, 386-393. Howard, R., Castle, D., Wessely, S. and Murray, R.M. renia. American Journal of Psychiatry, 152, 722-730. Sato, T., Bottlender, R., Schröter, A. and Moller, H.J. naïve patients before and after first-admission treatments. 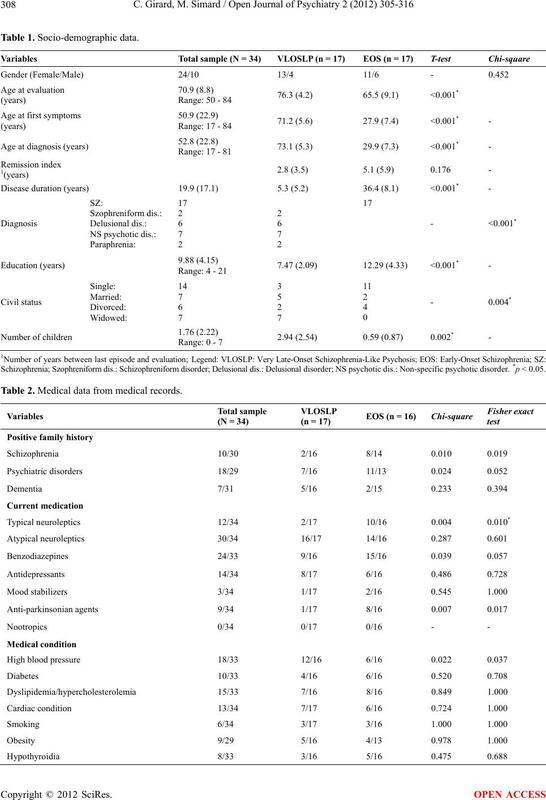 Journal of Geriatric Psychiatry, 24, 1166-1172.
and late-onset psychosis in a general population sample. Journal of Psychiatry, 33, 814-824.
psychosis. 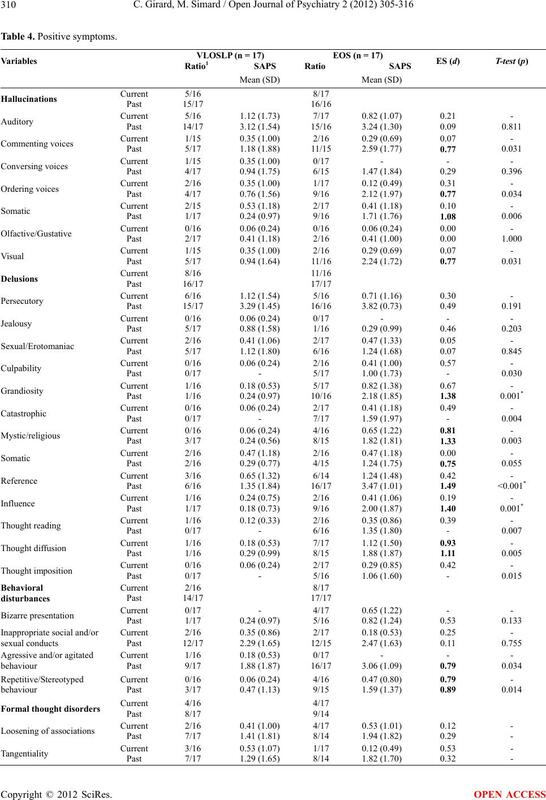 Aging and Mental Health, 13, 779-787.
renia-like psychosis: The effects of gender and ethnicity. International Journal of Geriat ric Psychiat ry, 17, 473- 479. Reeves, S., Hudson, S., Fletcher, H., Sauer, J., Stewart, R.
Journal of Geriatric Psychiatry, 19, 803-807.
national Psychogeria tri cs , 15, 69-72. Nervous Mental Disease, 190, 733-736. 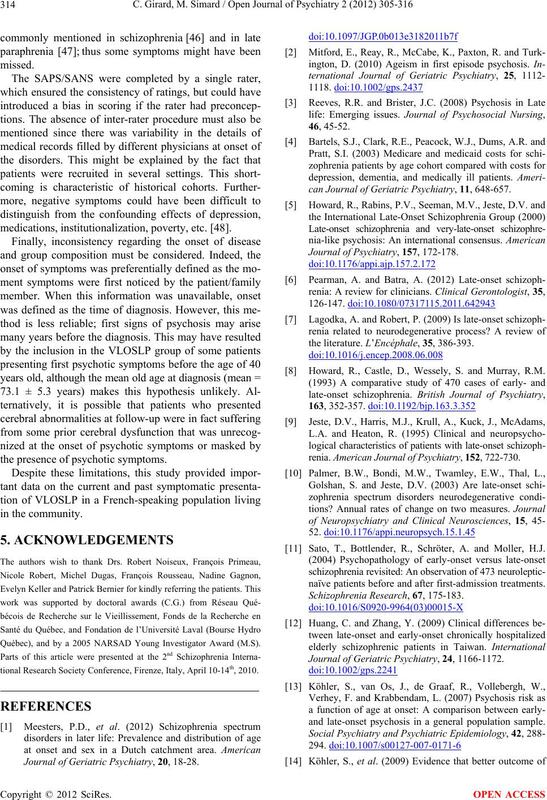 Mazeh, D., Zemishani, C., Aizenberg, D. and Barak, Y.
tish Journal of Psychiatry, 170, 511-514.
sitive symptoms (SAPS). University of Iowa, Iowa City. ative symptoms (SANS) University of Iowa, Iowa City. 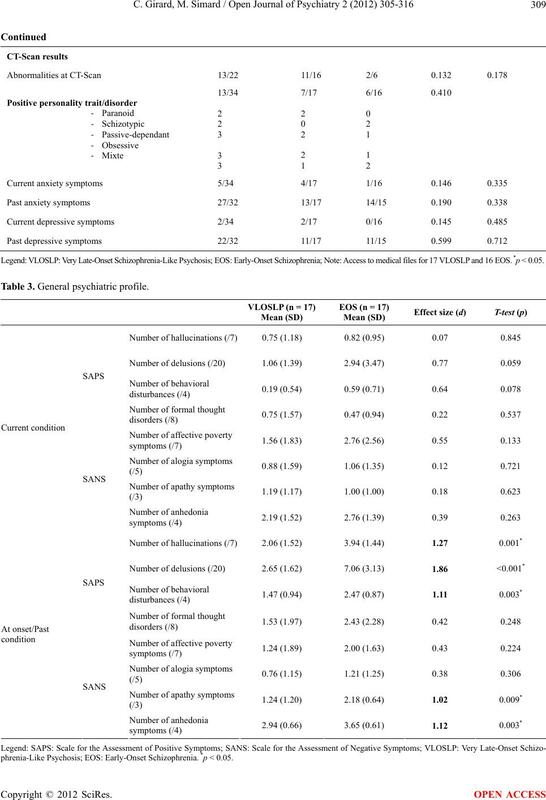 treatment of very-late-onset schizophrenia-like psychosis. Scott, J., Greenwald, B.S., Kramer, E. and Shuwall, M.
chosis. International Psychogeriatrics, 23, 742-748. Casanova, M.F., Stevens, J.R., Brown, R., Royston, C.
and Clinical Neurosciences, 65, 600-603. Girard, G., et al. (2011) Late-onset-psychosis: Cognition. analysis of participation and reasons for non-participation. Archives of Gerontology and Geriatry, 47, 173-187.
ish Journal of Psychiatry, 175, 416-421. Almeida, O., Levy, R., Howard, R.J. and David, A.S.